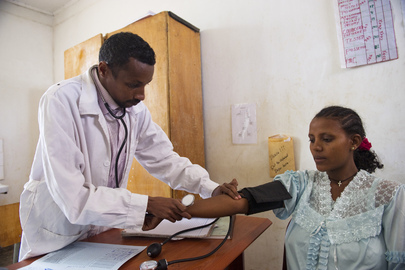 Despite successes in global health to combat specific diseases, progress remains slow particularly in sub-Saharan Africa. We discuss two challenges in the global health landscape currently: the waning hegemony in global health governance and the recurrent pendulum swing between horizontal (health systems focused) to vertical (single-disease focused) programming by donors and agencies. Using Ethiopia as a case study, our analysis highlights leadership actions that promoted both vertical and horizontal objectives. These included: 1) clarity and country ownership of purpose, 2) authentic engagement with diverse partners, 3) appropriately focused objectives, and 4) the leveraging of management to mediate policy decisions and front-line action. We conclude that effective leadership in global health can reconcile vertical and horizontal objectives, even with increasing numbers of partners and waning hegemony.